Hackney residents are invited to have their say on their ambulance service this Saturday (28 February), when staff from the London Ambulance Service will be outside Tesco on Morning Lane, to talk to people about the Service’s plans to become an NHS foundation trust. The London Ambulance Service has hosted the launch of a national stroke awareness campaign which aims to educate people about the symptoms of stroke. Londoners are being invited to have their say on the future of the capital’s ambulance service as it becomes the first in the country to consult on its plans to become an NHS foundation trust. A London cabbie has been reunited with the ambulance and hospital staff who saved him from a life-threatening heart attack. The Met Office has today warned that there is a 60 per cent chance of disruption in London tomorrow (Friday) due to more adverse weather being predicted. 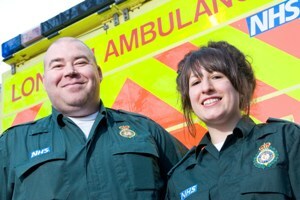 A woman who was injured in a car crash has been reunited with the crew who treated her – and influenced her to become a paramedic. The continuing adverse weather conditions have placed the Service under further pressure today. 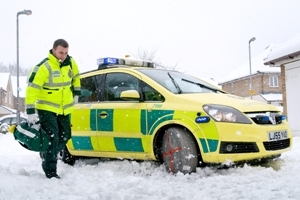 Londoners are being urged to use their ambulance service wisely and only call 999 for life-threatening emergencies after heavy snowfall in the capital today.